Never mind what Milla Jovovich said! It has been confirmed that upcoming 3D Hollywood flick Resident Evil: Afterlife, originally slated for August 27, 2010, will be released on January 14, 2011. Will New Resident Evil Movie Be Delayed? 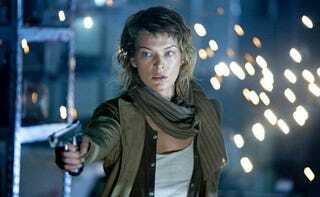 Jovovich, the film's star, tweeted that the movie had not been officially been pushed back, writing, "RE Afterlife IS NOT officially pushed. There have been talks of pushing it as they [are] not sure they can have it ready by July. We [are] trying as hard as we can to still meet the summer deadline though, so for the moment its still on for August." To fill the gap, the studio will be sliding up vampire film Priest from its original release date of October 1 to August 27 — because vampire movies are better for late summer than October. Resident Evil: Afterlife will be facing off with MGM's thriller The Cabin in the Woods, also a 3D film. RE: Afterlife is currently filming in Canada and will wrap up shooting this December.